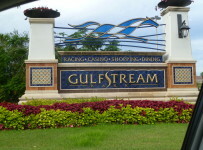 First post is 12:35 p.m. on Thursday for an 11-race card at Gulfstream Park. 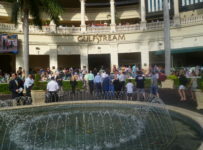 Meanwhile, fans and horsemen are looking forward to Saturday when Gulfstream will have the $300,000 Holy Bull (Grade 2) and four other graded stakes races. 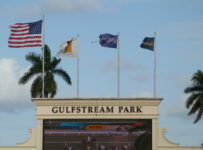 For Thursday, conditions are listed as fast for the dirt track and firm for the turf. 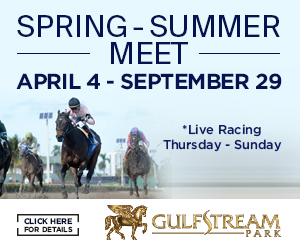 The feature tenth race is a starter allowance, with a $36,000 purse, at one mile on turf for 4-year-olds and up. 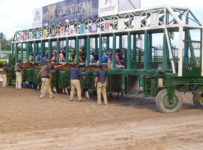 The carryover on the Rainbow 6 is $16,591. It will be on races six to eleven. Wednesday was the first day of a new Rainbow 6 pool. 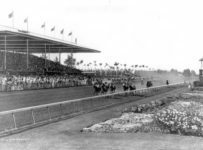 Wagering on it was $69,150. 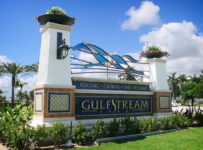 Per its rules on days when there are multiple tickets with the winners of all Rainbow 6 races, Gulfstream took out 20 percent and then divided 56 percent among winning tickets while putting 24 percent in a new carryover. There were 65 winning tickets, and each received $596.84 on the 20-cent only bet. 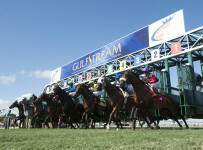 On Sunday, Gulfstream had a mandatory payout on a Rainbow 6 carryover that had grown to almost $4 million over 39 days. 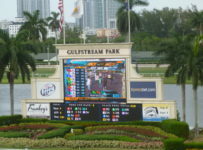 Bettors added $15,788,225 to a Rainbow 6 carryover, Gulfstream reported that it was a record North American single-day wager on a Pick 6 bet. 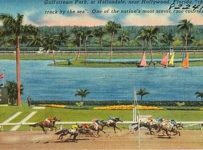 The Saturday card has twelve races with first post of 12:00 p.m. 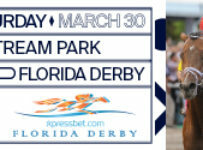 The Holy Bull is the 12th race, with scheduled post of 12:49 p.m. 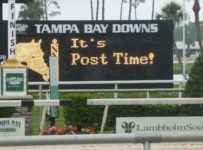 It is 1 1/16 miles on dirt for three-year-olds, and it is a points scoring race for the Kentucky Derby that will be run May 5 at Churchill Downs in Louisville, Ky. 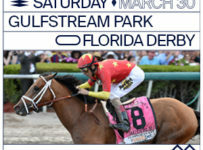 The 11-horse field includes two horses that won major early Triple Crown races last fall. 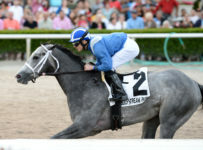 They are Enticed, winner of the 1 1/16 mile Kentucky Jockey Club (Grade 2) at Churchill Downs on Nov. 25, and Free Drop Billy, winner of the Breeders’ Futurity at Keeneland in Lexington, Ky., on Oct. 7. * $200,000 Forward Gal (Grade 2)—seven furlongs on dirt, 3-YO fillies and is a points scoring race for this year’s Kentucky Oaks on May 4.